My 11,500-foot rocky perch provided the perfect view of the lush green bowl as morning’s glow spilled across it. By the looks of the sticky-fresh elk sign I had stumbled into the previous evening, I felt seeing a bull or two within the first couple hours was all but a sure thing. Fact is, I had packed into this wilderness area a few days prior with nothing but a framed pack on my back and bow in hand, and from the moment I stepped into this wild place, there seemed to be no shortage of elk. There wasn’t a setting or rising sun that I didn’t find more than a few elk feeding through an open basin or hear the notes of a sweet bugle. It had been a perfect hunt as far as elk numbers were concerned; all I had to do was get close enough to slip an arrow between a couple ribs. I live for mornings like this. Not to say I dislike the early morning views from a treestand in a wooded creek bed come November. However, for me, there’s nothing like striking out on your own into areas unknown with only the bare essentials on your back, far away from anyone or anything that has to do with modern civilization. I was first drawn to these wild places as a young boy trying to make sense of his teenage years. Of course, those wild places were on a small 160-acre tract of Texas land, but when my roots spread in Colorado in the early 1990s, my sanctuary transformed into millions of acres. I guess being new to the West at the time, and still having eager legs and a strong back to explore with, grabbing the bow was the prudent thing to do for a guy who lived for wild places and the challenge of the hunt. During those early years, it was my ego that caused me to dig deep for those moments that only the backcountry can bring. But as the falls have come and gone, something else, something more spiritual, has brought me back season after season. At first, I couldn’t put a finger on it, but when unforeseen circumstances caused me to hang up my bow one September, I realized what I was truly missing. The following season, when I climbed an alpine ridge and witnessed the Creator’s autumn canvas, I realized my desire to be in wild places was more than just releasing an arrow. Over the years I have taken wild places and the wild things that live there for granted on occasion. I guess I just felt they would always be there. But as westward expansion continues to clobber my part of the world, so to speak, and federal land grabs seem to be a hot topic these days, my attitude has changed. If you take a good hard look at it, other than our Founders forethought in declaring our “inalienable rights,” these public, wild places we dutifully enjoy are one of the greatest gifts we have ever received as Americans, and are some of the greatest gifts we will ever pass on to the following generations. Barely 30 minutes had passed on that rocky perch when the distinct sound of smashing antlers echoed across the basin. In seconds, I zeroed in on where the racket was coming from, and to my surprise two heavyweights were having fits with each other on the other side. Their tan hides seemed to glow in the early morning sun, and as I studied them through my glass, I could clearly see it was a pair of heavy-horned 5x5 bulls that were big enough for this wilderness bowhunter. Waiting on this playground tussle to come to an end, and for the bulls to move out of sight before striking out after them, I watched the two fiery-eyed foes go at it for a couple minutes. 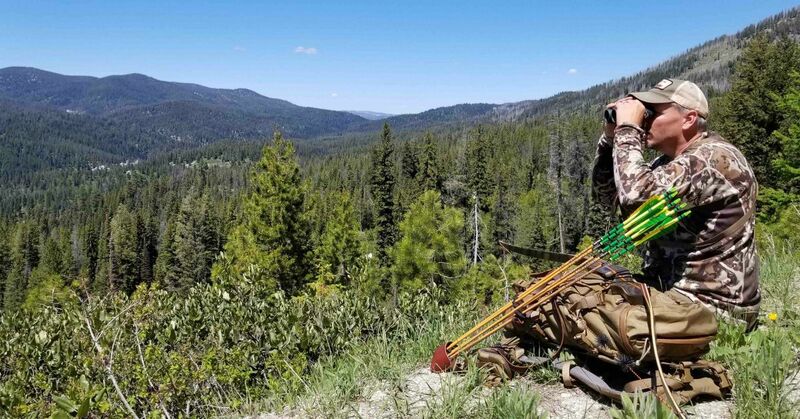 Needless to say, having a ring-side seat to one of nature’s western furies only added to the week’s already abundant elk activity, and sticking a bull with a well-placed arrow would only be the icing on the proverbial cake. Although all good things must come to an end, the scene of two bulls grinding heavy antlers on a freshly lit ridge will stay in my memory bank for decades to come. After the pair moved over the ridge, I made a mad dash across the basin and set up in a cluster of fur below the ridge. With an arrow nocked and cow call in hand, I threw some of my best love-sick squeals over the ridge. I knew any moment I would see the bronze body and ivory tips of one of the bulls, but nothing happened. After several minutes and a half dozen call sequences later, I still had no takers, so it was time to make a move. With the mountain breeze blowing in my face, I eased my way up the rocky ridge and was surprised to see not only two sets of antlers, but three more through the screen of mountain brush at less than 80 yards. With the bulls focused more on each other and a handful of cows milling around, I pushed forward at a snail’s pace, keeping every stitch of cover between me and them as I zig-zagged toward the closest bull. Peeking through the limbs of a 10-foot pine, I zapped his side with my rangefinder. It read 47 yards, and like a machine, my bow came back with ease. The slip of my release came as a surprise, and when I saw my arrow bury fletch-deep behind his shoulder with a heavy whack, I knew the tag in my back pocket had virtually found another home. The mountainside erupted with the sounds of scattering rocks and clattering hooves, and as they made a mad dash down the ridge and across the basin, I was pleased to see only four bulls pushing up the other side. In a matter of minutes, I was standing over my fallen prize. As I stroked his handsome coat and inhaled his rich musty elk smell, everything came into perspective. It’s the chase that draws me, but the wild places that keep me, so let’s do our best and do our part to keep wild places wild! Editor’s note: Click here to discover the author’s four favorite gear items for wilderness archery elk.